We love hot dips and we're pretty sure this one is going to be a hit! 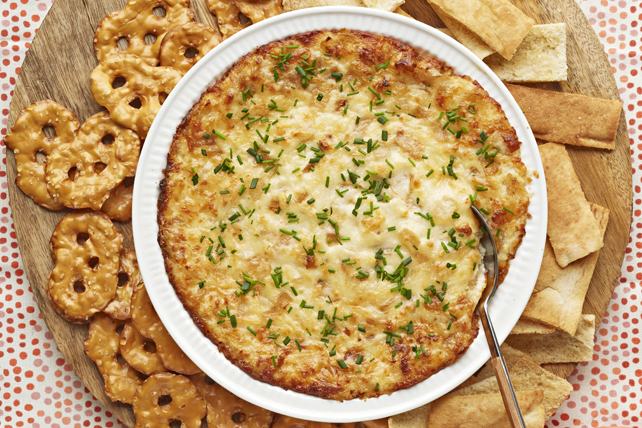 Creamy, cheesy and baked until bubbly, this Cheesy Caramelized Onion Dip is a party-perfect appetizer! Heat oil in large skillet on medium heat. Add onions; cook 13 to 15 min. or until tender and golden brown, stirring frequently. Remove from heat. Stir in cheese and mayo. Bake 45 to 55 min. or until dip is heated through and top is golden brown. Let stand 5 min. before serving. Sprinkle with chives. Mix dip ingredients as directed; spread onto bottom of microwaveable 9-inch pie plate. Microwave on HIGH 5 min. or until heated through. Let stand 5 min. before serving. Sprinkle with chives. Prepare using a Spanish onion. Serve with your favourite crackers and/or pita chips.